This sweeping panorama was captured under tough conditions. 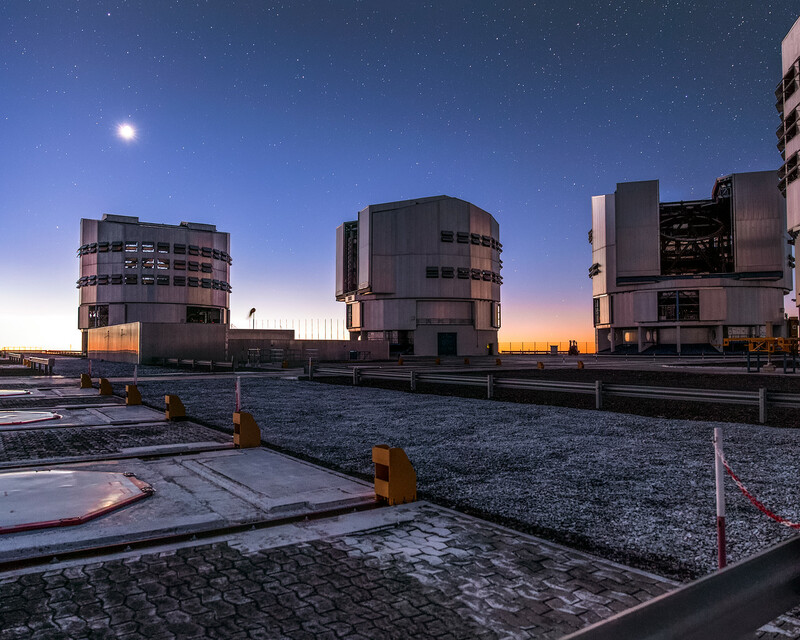 ESO’s Very Large Telescope (VLT) is one of the most advanced observatories in the world, gathering astronomical data of unsurpassable clarity from Cerro Paranal, an isolated site atop a lonely mountain in the Chilean Atacama Desert. This far-flung corner of the globe has many benefits; it offers some of the driest and clearest observing conditions on Earth — some of the weather stations in the Atacama Desert have never recorded rainfall! — and a total lack of light pollution. 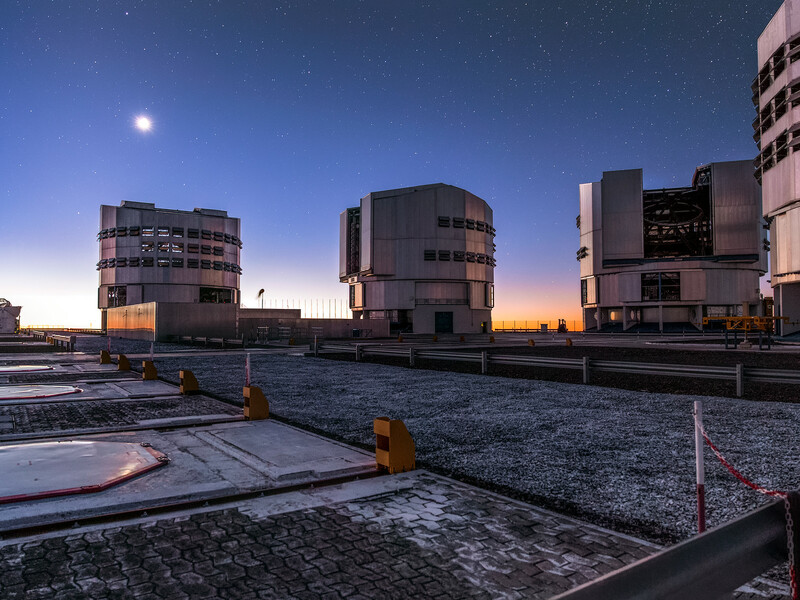 Paranal’s stargazers can see a sky full of stars even before sunset, while the sinking Sun illuminates ground frost and casts an ethereal and irreplicable glow across the entire observatory. This isolation also has its downsides. Reaching the remote site takes dedication. There is no public transport to Paranal, so visitors must travel by car from Antofagasta airport in the north, or 110 kilometres from the nearest town to the south. However, this doesn’t stop scientists, visitors, and even film crews venturing to the site. The inconvenience is repaid with breathtaking views, such as the one captured here by Miguel Claro, a photo ambassador for ESO. The VLT is formed of not just one telescope but eight, seven of which are visible in this panorama. The telescope comprises four large 8.2-metre Unit Telescopes (the boxy, angular structures to the right of the frame) and four smaller 1.8-metre Auxiliary Telescopes (the curved, open domes to the left — three of the four can be seen here). These smaller telescopes are moveable, meaning that the VLT can be used as a wonderfully adaptable interferometer. Interferometry is a technique of combining data from multiple telescopes such that they essentially work together as one larger telescope, vastly increasing the amount of scientific research they can do. 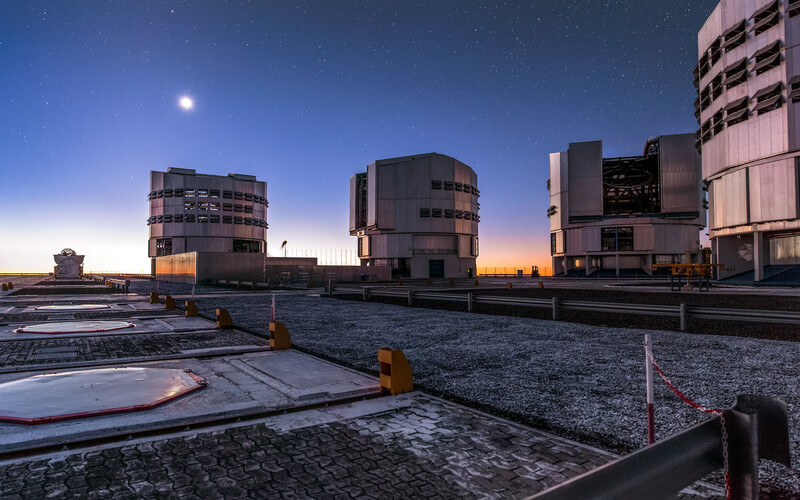 Those interested in seeing Paranal for themselves are in luck — free public tours run every weekend. Visitors can tour one of the Unit Telescopes, the famous La Residencia hotel, and sometimes the control rooms where the astronomers work. More information is available here.